Of course, XBRL is not the only way that data can be shifted from place to place. There are number of alternatives that are sometimes considered by regulators, government agencies and enterprises that need to collect and use significant quantities of performance reporting data. PDF is heavily used for reporting. It allows the presentation defined by the report author to move around electronically, without alteration. However, PDF is an inherently document-centric format, and does not allow the reuse of information without rekeying. The Adobe corporation has created a number of extensions to PDF to allow the capture of data in fixed format forms, however reusing and altering the structure of these forms is a complex process and requires the use of a range of proprietary technologies. While some relatively straightforward forms are commonly captured using these capabilities this technology does not support the independent definition of terms nor, more sophisticated, multi-dimensional data. PDF does not easily support system-to-system data transfer, which means that its use for highly reliable reporting is restricted. PDF provides a well understood mechanism for enforcing the format — the look and feel of the document — with any data contained in it. HTML is the way that pages on the web are formatted and is a highly flexible and powerful format, and possesses a range of forms capabilities. Like PDF, HTML is basically a document-centric format, in which the presentation — the look and feel — of the information on the screen is the highest order requirement supported. HTML doesn’t support the preparation of definitions, nor (without significant programming) the testing of data being inputted in a form. HTML doesn’t support system-to-system data transfer and involves custom programming to shift data from forms into receiving systems. HTML forms are useful for straightforward data capture, but not sophisticated reporting. Of course, with the addition of Inline XBRL, HTML can support XBRL based performance reports, with the look and feel sought by the preparer of those reports. XML is a foundation standard developed by the W3C and is what XBRL is itself based on. It is certainly possible to develop sophisticated reporting solutions using XML, but third party software needs to be specially developed to support the specific vocabulary developed in the design of the solution. Using XML doesn’t take advantage of the hundreds of developer-years that have been expended in the design and standardisation of the reporting-specific capabilities of XBRL. Using XML for reporting is data-centric, but it doesn’t give rise to the benefits that XBRL offers including support for specialised reporting units (such as currency and shares) accounting concepts (such as debits and credits) or the complex interrelationships between reporting terms supported by XBRL. JSON is a relatively new, and very popular electronic format, used to transmit data, generally as an alternative to XML. JSON uses attribute-data pairs and is very easily generated and consumed thanks to strong support from a significant number of programming languages. 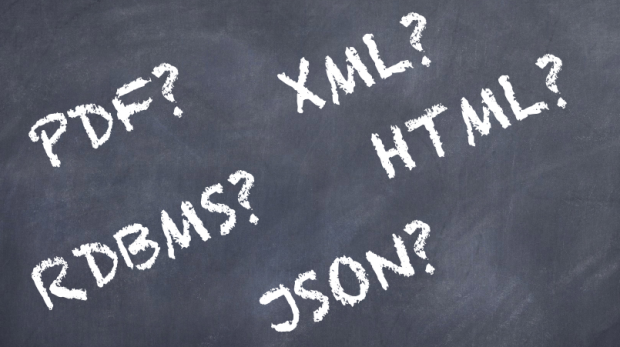 JSON doesn’t natively support the sophisticated error checking, validation and formula functions that XBRL offers, and like XML isn’t specially designed to deal with performance reporting data. JSON doesn’t have support for data definition and data relationships in the same way as XBRL. It’s strength is its relative simplicity and performant nature. Relational Databases (“RDBMS”) are the way that the vast majority of Accounting and ERP systems manage information and are a vital part of most corporate and government systems. They can be applied to almost anything and can (with specialised programming) be used for validating as well as defining data. The main problem that RDBMS systems face is that they can’t transmit data across different RDBMS systems. As a result, they tend to be the repository and analytical home of data once it has been transmitted in a standardised format from place to place. extensive vocabularies supporting most of the major reporting frameworks including US GAAP, IFRS, Japanese GAAP, Chinese GAAP, regulatory rules including Basel III and Solvency II as well as frameworks such as GRI. embedded support for sophisticated error checking and data validation, including a wide range of accounting and financial concepts (from currency, stocks and flows through to accounting logic). extensive software support, including open source support. All in an open, freely licensed standard supported by an international not-for-profit public-private consortium. Is it simple? Not as simple as anyone would like. You can help make XBRL simpler by joining the consortium and contributing your ideas in this area. XBRL technical specifications can be found on our XBRL Specification sub-site.